September 23, 2014 -- If you’ve ever gone out to see music in Sea Cliff, there’s a pretty good chance you’ve seen Frank Ferrara. A central figure in the local music scene, Mr. Ferrara has made his mark as both a performer and instructor - and in the near future, perhaps as a visual artist. It was just happenstance that Mr. Ferrara ended up in Sea Cliff at all, he explains, having connected with Steve Silverman of the Guitar School of Roslyn at a Huntington gig (that he says he nearly chose to bail on) a number of years ago, and then, from his experience teaching there, establishing relationships with local musicians. Four years ago he officially became a resident of the village. Locally Mr. Ferrara teaches nearly 50 students, ranging in age from 4 to 70, from beginners to advanced players, in guitar, bass, drums, keyboards and other instruments. But what makes Mr. Ferrara unique among private music teachers is his emphasis on developing in musicians the ability to play as a part of an ensemble, helping students of all ages form bands - grouping them according to skill level and musical tastes. Sea Cliff Resident Heather Snyder, whose 11 year old son, Ethan, has been a student of Mr. Ferrara for the past year and a half, and who along with the band that Mr. Ferrara helped assemble, has played at Sea Cliff Palooza, Teen Serenade and other public venues, said "Frank encourages his students to explore the type of music that gets them most excited and then easily moves from instrument to instrument teaching each band member his or her part. His patience runs deep and in no time he has a group of kids performing and making music together, It's beautiful!" After Sea Cliff resident Patrice Kaider, who for more than a decade has organized the Civic Association’s Sunset Serenade summer concert series, approached him six or seven years ago offering an hour or two of time for his young students to perform at one of the Thursday night summer concerts, he saw an opportunity and started grouping young musicians together to perform as bands. Teen Serenade was thus born, and since then, the groups that have developed under his tutelage have performed at open mic nights at Still Partners or been invited to perform both at the North Shore Homecoming and Sea Cliff Palooza. “It’s great that young people have these opportunities to play," Mr. Ferrara exclaims. Often, he will invite a student to perform with him at one of his own gigs. "Frank brings all levels of musicians together, as long as they want to further their musical ability," said Dan Roth, co-owner of Still Partners and a drummer who is perhaps as ubiquitous in the local music scene as Mr. Ferrara. "He can find a common thread and get them playing." "He has that rare gift of bringing out the best in people," said Sea Cliff resident Dorothy Bennett. "There have been countless times when he has invited accomplished musicians and novices both old and young (including my husband and 13 year old son) to play at different venues. Somehow he makes it all come together seamlessly!" 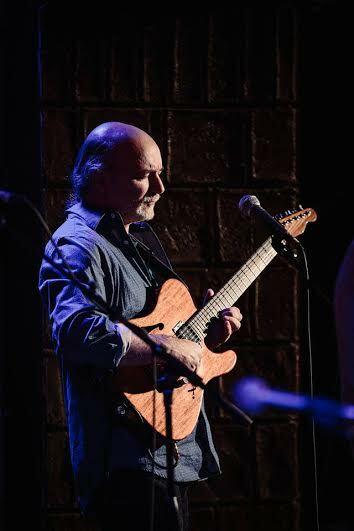 When he's not teaching, Mr. Ferrara can often be found recording in the studio or on stage - either performing solo, or with one of the four bands he regularly plays with, or even with a band who has invited him to jam on a few songs. "Sometimes, I just sit in if someone is playing," he says. " I just love being here. I feel like a town musician in every sense of the word. Music really is an important part of this town." Mr. Roth said Mr. Ferrara "has the unique ability to raise the level of any ensemble he plays with—somehow being able to bring the best playing out of a group of people just by sitting in. It's a treat to hear him play in any situation and I'm honored anytime I get to play with him." Well versed in a variety of musical genres, Mr. Ferrara performs "straight ahead jazz" with Meridian, and with Crash My Party its an eclectic mix of salsa, country and reggae originals written by band front man Andy Gertler. 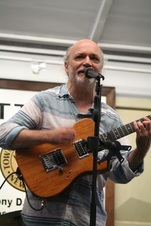 He also performs and records with Roger Street Friedman, whose album the Waiting Sky was released this past January and has gotten considerable airplay on WFUV. "Frank Ferarra is a world class player," said Mr. Friedman. "He has an innate sense of what fits and has the amazing ability to play exactly the right notes for any tune. There are many times when we're on stage, or in the studio together that I am completely blown away by his playing. Not only is he one of the best guitarists alive, he is the nicest, most gentle and soft spoken of people. His generosity of spirit makes having him in my band an absolute joy." In addition to his music, Mr. Ferrara, during the past few years has also ventured into the visual arts as a photographer, working with artist Malu Ribeiro, his partner in life and art, on a project called Eslabon ("chain link" in Spanish), through which the two seek to create links between each other, artists, musicians, other types of "creators," and the community. This Friday evening at the K. Diresta Collective in Sea Cliff, the couple will establish such a link as they present a slide show about their artistic approach, as well as a short film and a performance by Mr. Ferrara with acclaimed percussionist and Queens College Music professor Michael Lipsey. "I'm just grateful to be here in a community where I'm able to make a living at something I love doing," said Mr. Ferrara. "I feel supported and appreciated and grateful that the is such a pool of great musicians where I can just go around the corner and have fun playing."